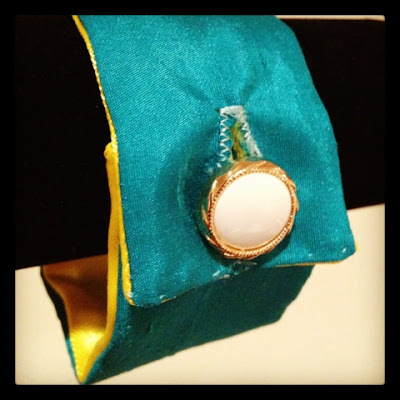 This is a fun, unconventional accessory, a soft fabric alternative to a bracelet. It could dress up an everyday outfit or add some bling and color to a Steampunk costume. This cuff is like a cuff of a shirt, but it's not attached to a sleeve! Wear it like you would a cuff, but with a sleeveless or short-sleeved shirt, in place of a bracelet. Show off the decorative button with an attractive splash of color.